Since the firm principal and notary public, Perry Novotny, is notary who is a member of both the Israel State Bar (2002) and the New York State Bar (2001), we offer services in both Hebrew and English. The majority of the notorial services offered can be performed on the same day and many do not require physical presence in our office and can be taken care of with the assistance of our messenger service (notorial services may be performed outside our office at added cost). For further information concerning how we may assist you please contact our office between the hours of 9 am and 5 pm, Sunday through Thursday (off hours services are also available but require scheduling). Signature verification by a notary on a document serves as proof of the signer’ identity and signature authenticity and is usually required in powers of attorney, affidavits and other declaratory documents. Persons requesting this service must verify their identity to the notary public with a valid Israeli ID card or passport. 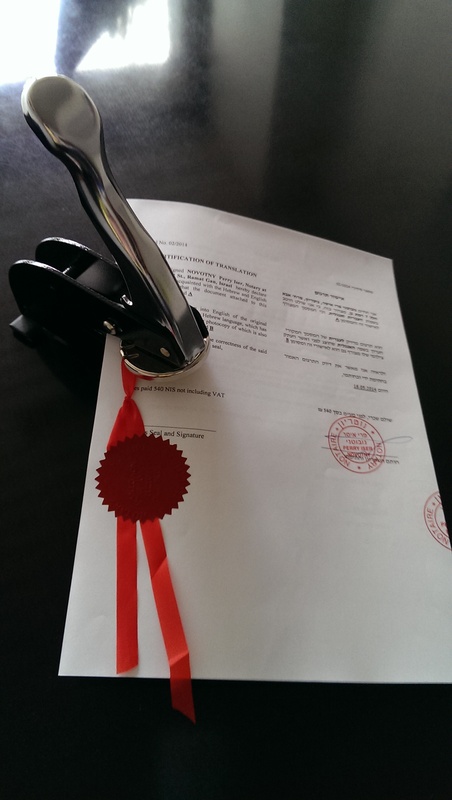 A Notarized Translation is a document translated from another language with the translation verified by the notary. Notarized Translations are often required for formal or business purposes in Israel or abroad. Unlike the Notarial Translation, a Validation of Translation means that person who translated the document verifies the accuracy of the translation under oath before the notary. The notary does not authenticate the translation but rather that the translator's oath. This is a significantly cheaper option than the Notorial Translation but is of course not as valid and also used when no notary is available to verify the actual translation due to language barriers. Certified Notorial Copies provide assurances that a document is an exact copy of the original document and are often required by government agencies and in certain financial or business transactions. An original document is required in order to provide this service as the notary must compare the two documents prior to providing the service. Certification of Life is a confirmation by the notary that an individual who appeared before the notary is alive. This service is often required by as proof for continued pension payments.